Available October 2018, just in time for Halloween, Kotobukiya presents Ash Williams from Evil Dead 2. Ash’s appearance is expertly translated into the BISHOUJO style by series illustrator Shunya Yamashita. Reflecting the violent nature of the film, Ash’s clothes are tattered, she stands on an exquisitely detailed base modeled after the floor of the cabin from the film along with a decomposing hand forcing its way out from the cellar door. Cuts and bruises run along the legs, stomach, and face. 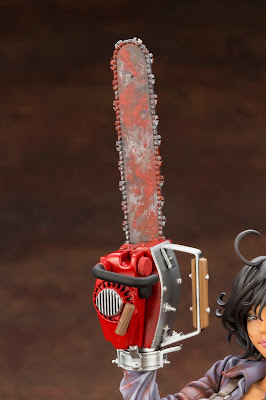 Detailed chainsaw in hand, so to speak, along with a shotgun strapped to her back. The Necronomicon Ex-Mortis is detachable, allowing you to display it wherever you like or with another action figure. Retailing for $89.99, fans of the Horror Bishoujo line will have a nice treat waiting for them come October.